The BBAs next assignment was to bake bagels from The Bread Baker’s Apprentice: Mastering the Art of Extraordinary Bread . I was experiencing a bit of white flour overload, so I made the bagels, but I also consulted Peter Reinhart’s Peter Reinhart’s Whole Grain Breads: New Techniques, Extraordinary Flavor for advice on using whole grains. The result? Well, my husband ate one of them and said, “Hey, these taste like bagels!” Mission accomplished. The main difference between the whole grain bagel recipe and the one made with white flour is that the former involves a soaker and a biga, while the latter calls for a sponge. I have a lot of atta flour on hand (from other baking experiments), so I used it instead of my normal whole wheat, and it worked very well. The one piece of advice that I’d give is to make sure that the flour is fully hydrated when you make the biga and the soaker, even if you have to add more water. I didn’t do that, and I had to pick out a few hard dough pieces before I could proceed with making the bagels. Also, next time I’m going to form a ball and poke a hole in it, so that I don’t have the ends separating on some of the bagels. You can find a list of those participating, here, and you can find the recipe on-line, here. Until next week, when we bake brioche. And please check out Susan’s bread baking roundup every Friday: Yeastspotting. Great that your husband loved them. They look great! I love the shape of them, crescent like. So nice that your husband enjoyed them. I still have to make my bagels. Yours look good. Your bagels look fantastic! I’ll have to try a whole-wheat version. Your bagels are really beautiful ! Right on! They look wonderful. I had a slight mishap- I lovingly put my beautifully-shaped bagels in the fridge to proof and the next morning they were flat as pancakes! I did bake them up and they were delicious – ugly, but delicious! I need to try whole wheat bagels soon. Yours look great! If you want to give the “snake” shaping method another try, try spritzing the dough with water before joining the ends — that works well for me. Those look great. 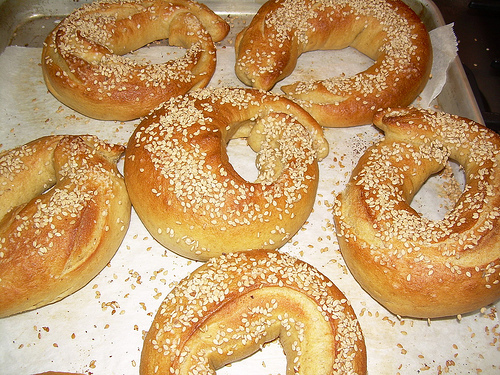 I love bagels with sesame seeds.